Every chess player, who begins his games with the move 1.e2-e4, should be perfectly prepared to counter the move 1...c7-c5, after which there arises the Sicilian Defence on the board. Why is this opening so dangerous for White? The point is that in all the basic variations of the Sicilian Defence the fight is double-edged and often White risks at least as much as Black does. White is practically deprived of the possibility to simplify the position by numerous exchanges of pieces and to try to steer the game into a drawish outcome. There is another very important circumstance as well. 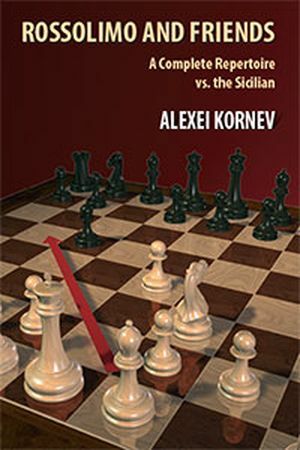 In almost all the variations of the Sicilian Defence an enormous amount of theory has been amassed and not all the chess fans can afford to spend so much time and efforts in order to learn the endless variations in all the main lines. first and the second part of this book and they both satisfy perfectly these criteria. As theoretical material they are not so huge as the Najdorf variation, the Chelyabinsk variation, or the Rauzer attack. On the other hand White�s play is very sound from the positional point of view. He wishes to develop his pieces as quickly as possible. He exchanges in numerous variations his light-squared bishop, which later may turn out to be �bad�, because White�s e4-pawn is placed on a square of the same colour. In the third part of the book, numerous second moves for Black are analysed, besides 2...Nc6 and 2...d6 and no doubt, the most dangerous move for White is 2...e6. I have suggested as an opening weapon for him the quite modern move in the last several years � 3.g3. You should accept as a proof of its strength the fact that the actual World Champion M.Carlsen plays often like this. Many authors of books on chess theory neglect somehow correspondence games. I appreciate the real value of the games, concerning the analysed variations, regardless of where they have been played. In fact, the evaluation of many variations, quoted in this book, are based on correspondence games. Many of them have been played not only in some famous competitions like ICCF (International Correspondence Chess Federation), but in some other less popular events. I would like to send my best wishes to my readers for a successful application of the variations in this book in their practical games! I appreciate very much Margarita.Schepetkova�s invaluable help in our work over this book.